Limiting climate change poses major challenges to traditional decision making, but progress is now being made. This is the second of two posts stepping back a bit and considering why the climate change problem is so difficult to solve. My previous post looked at some of the physical feature of the problem such as the scale, dispersion and diversity of emissions. This post looks more at the economic, social and psychological barriers to action. The first area of difficulty is in perceptions of the facts. The science of climate change now one of the best established areas of human knowledge. However a gradual change, for example with temperatures on average increasing by around a fifth of a degree per decade, may be difficult to notice. Shifting probabilities of extreme events may be similarly difficult to perceive. Consequently, even facts well-established academically may not readily become part of acknowledged personal experience, and so will not be as readily internalised into decidion making. This may be compounded by an availability bias. Those regions changing most rapidly and visibly, especially the arctic, are remote and sparsely populated, so changes are less available to people despite the best efforts of reporters. These difficulties are compounded by a framing effect due to daily or seasonal temperature variation. A three degree rise in annual global mean surface temperatures may not sound like much if you experience day to day fluctuations of much more than that, even though in reality a change of this magnitude would lead to very severe consequences. As a result of this framing, many of the consequences of climate change may not sound so bad to those not closely involved with the issue. On the other hand, the risks of some solution may be seen as high – “the lights might go out” – because in many ways the current system works well. People’s subjective perception of the balance between risk and reward may therefore be quite distorted. Finally, the perceived solutions to climate change may conflict with some value systems (see here and here), making people less willing to accept what needs to be done. The difficulty of action is compounded by long (and uncertain) time lags between cause and effect. Many consequences, such as the worst effects of sea level rise, are thus seen as belonging to the distant future. They are beyond the normal planning horizons of governments, companies and most other institutions – though it is worth noting in many cases not outside the lifetime of today’s children. It also challenges our own individual decision making. We often have a tendency to concentrate on those problems which seem most urgent. This makes climate change difficult for people, companies and governments to deal with. Damage is also often seen as remote in place as well as time. Most people will tend naturally to be less concerned with changes perceived as unlikely to affect their immediate neighbourhood. Furthermore, career and other motivating social imperatives are not often aligned with dealing with the climate problem. A bonus may depend on this year’s profits, or a promotion on generating local value, an election on a more immediate problem. And social norms may encourage bigger houses, bigger cars and more air travel despite their effect on the climate. Many people (including me) would be reluctant to live in a smaller house for the sake of the climate. The most pervasive barrier to action is that emissions and the benefits of the associated activity tend to be largely local, whereas the resulting damage is global. The global nature of the climate means that a stable climate is a global public good in the economic sense. However this public good must be maintained by avoiding harmful emissions. As in all such cases, there are incentives for some to free-ride on the efforts of others to support the provision of this public good. No one country can by itself sustain a stable climate – although China can make a huge difference – but there is no global enforcement mechanism to oblige co-operation. The ability of any one company or any one individual in influence the outcome is smaller still. People are right to feel that they alone cannot solve the problem. There is a need for co-operation at a global level. Tropical deforestation, a major source of emissions, provides a further difficulty. It is hard to solve in part because governance is often weak even at the national level in forest countries. This leads to weak constraints on the actions of companies and individuals, often pursuing their own incentives, which fail to reflect the wider environmental damage. The Montreal Protocol on CFCs offers an interesting contrast, in that it was achieved in part because it lacked some of the characteristics of climate change. Although the science is complex it could be boiled down to a simple message: “chemicals we are putting into the atmosphere destroy the ozone layer.” The lags involved were perceived as comfortably within normal human timescales. And the consequences of failure were easy to present as scary. “If we don’t fix this problem lots more people will get skin cancer” is about as simple and relatable as messages get. Added to this, the uses of the chemicals were limited to a few sectors of the economy, with readily available substitutes. This made the costs appear much lower, and opposition from businesses and their allies, some of whom would benefit from regulatory change, much less strong. The result was relatively prompt and effective action. This also points a way forward for climate change. The extension international agreement to limit HFCs because of their effects on the climate is an example of similar forces at work, and is a cause for optimism. A major threat to the climate has been addressed. Although not perfect, the agreement appears to have every chance of being successful. This is despite having many of the barriers to action that hamper all attempts to address climate change. What was absent was the scale and cost of decarbonising the energy system. But even here there is progress. Low carbon technologies are rapidly improving and falling in cost, in some cases to a spectacular degree. This is lowering the barriers to action, and will do so to an ever increasing extent. It is creating a powerful constituency for action. There are now many companies invested in the transition to a lower carbon economy and jobs in low carbon industries increasingly outnumber those in high carbon sectors. Again this will increase over time. These trends have combined with the greater political awareness of the problem, and the increasing desire to do something about it, which is embodied in the Paris Agreement. The reactions to statements from the USA of intention to withdraw from in the agreement indicate how solid the international consensus has now become. While the Paris Agreement provides an overarching framework, the hard work of emissions reductions is now being achieved by a vast and growing range of regulatory interventions across the world. There is a huge diversity of regulation now in place, from carbon pricing to emissions standards to technology incentives. Compared with the situation as recently as the beginning of this century progress has been huge. This is a counsel of optimism, not of complacency or of naiveté about the rate of progress compared with what is needed. Limiting dangerous climate change will still require a great deal of hard work, and quite a lot of luck. But progress has been enormous despite formidable barriers, and there is no reason why progress should not continue. A stable climate is non-rival (someone can benefit from it without limiting the ability of others to do so) and non-excludable (there is no way of preventing someone benefiting). According to the 2009 movie Star Trek this concept of a public good is sufficiently important to be included in the education curriculum on the planet Vulcan. The reference to the definition using the terms non-rival and non-excludable occurs during the first scene on Vulcan, about 15 minutes into the movie. This entry was posted in climate change, Climate change policy, public opinion and tagged climate change, climate change policy, decarbonisation, psychology and climate change, public opinion on climate change on 06/06/2017 by adamwhitmore. There are many ways of designing a wealth fund based on revenues from carbon pricing. Debate about these is necessary, but should not distract from the merits of the broader proposal. Last month I outlined the value of the carbon emissions, and the possibility of establishing a wealth fund based on revenue from carbon pricing. This post provides some brief responses to questions that have been raised in response to this proposal. There are many good design options to choose from. Would the fund necessarily be national? No. There are many national wealth funds in operation, and national carbon wealth fund may well be a pragmatic way forward in many cases. However, the Alaskan wealth fund is an example of a state based scheme, and others would be possible. In the EU a fund could also be established either at EU or Member State level. An international fund would be difficult and perhaps impossible to establish, but would appropriately reflect global nature of the climate change problem. How would such a fund be governed? There are many options here. The most important criterion is that governance should benefit the ultimate owners of the asset, namely citizens, rather than the state or special interest groups. This implies some independence from government. Other criteria such as transparency and ethically sound investment will also be important. Some have advocated a fully independent trust fund. However in practice some degree of government oversight is likely to be required. How would this global public good be allocated internationally? The distribution between nations of access to the atmosphere has proved a major point of contention in global negotiations on limiting climate change, and this situation appears unlikely to change. However existing carbon pricing regimes – or simply emitting free of charge – already use up a global public good. Giving citizens and governments a greater stake in increased carbon prices is likely to decrease the quantity of emissions, and so the proportion of the global commons used. This makes the approach I have proposed more compatible with good stewardship of the global commons than existing arrangements, at least for the next 50 years until revenues start to decline. What would the macro-economic effects be? These effects would probably not be large, at least for a national UK fund. The payment into a UK fund would be at most around £16 billion p.a. assuming much greater coverage and higher carbon prices than at present, a little under 1% of GDP per annum. Even this would be unlikely to cause major economic dislocation, especially if phased in over a few years. The fund would grow large over time, reaching around £860 billion by the end of the century, depending on many factors including which other environmental taxes were included . However this is not vastly larger than the Norwegian fund today, which is for a very much smaller economy. Furthermore any fund would have the effect of redirecting revenue from consumption to investment, which would probably have a positive macroeconomic effect in the context of historic UK underinvestment. Would such a measure be socially regressive? The concern here is that poorer households spend a larger proportion of their income on energy than richer households, and so energy taxes, and thus carbon taxes, tend to hit them disproportionately harder. However poor households still spend less on energy, and therefore carbon, in absolute terms than richer households, so an equal dividend, as I’ve proposed, would have a net progressive effect. Furthermore, households account for only a minority of energy use, but would get the full benefit of dividends (or at least a large proportion), increasing the extent to which it is progressive. However there are some important intergenerational issues to consider. The proposal for a fund takes the view that present generations should safeguard capital assets so they retain value to future generations. This is in line with the standard definition of sustainable development. However there are distributional issues here which need to be addressed. Some present citizens will be worse off. How would it fit with other green taxes? The proposal is clearly consistent with using green taxes more widely as a policy instrument. What’s different from the standard approach to green taxes is the suggestion of placing revenue in capital fund rather than using revenue to fund current expenditure. The landfill tax to which I referred in my original post currently raises around a billion pounds per annum. It would be natural to add this revenue to a UK wealth fund. Would distribution to citizens be the only use for funds? There is no reason some of dividends from the fund should not be used to fund things like R&D. As I have previously discussed there are many legitimate calls on revenue from carbon pricing. However there are many compelling arguments for allocation direct to citizens, and this should in my view be a priority for the fund. Each of these questions requires further elaboration of course, and there are many other questions to be resolved. The design of any major new institution such as a carbon wealth fund will require a great deal of consideration of a range of issues. However further examination appears to strengthen rather than weaken the case for such a fund. Thanks to John Rhys for raising some of these issues. A variant of this post, responding to John’s points, was published on his website. This problem does not arise for the conventional resources (such as oil and gas) that typically provide the income for sovereign wealth funds of the nations where the resources are located. There is an interesting question as to whether countries should have full property rights to natural resources within their territories, as is often assumed at present, but this is too large a subject to go into here. The assumption here is that increasing prices from current low levels will increase revenue. Carbon prices would increase by a factor of say five or more in many cases, and it is unlikely that emissions would decrease by an equal factor – though if they did it would be very good news. Assuming that the UK reduces its emissions in line with the Climate Change Act target of an 80% reduction from 1990 levels by 2050, and then to zero by the end of the century, and that 80% of emissions are priced at the Social Cost of Carbon as estimated by the US EPA, converted at current exchange rates of $1.25/£. Sustainable development is usually characterised as meeting the needs of present generations without compromising the ability of future generations to meet their own needs. This entry was posted in carbon pricing, carbon taxes, Climate change policy, emissions trading, public opinion and tagged carbon pricing, carbon taxes, climate change, climate change policy, emissions trading, emissions trading scheme, EUETS on 22/03/2017 by adamwhitmore. How common is your opinion on climate change? People tend to underestimate how many others accept the reality of human-induced climate change, while estimating that their own views are the most widely shared. They also underestimate the degree of consensus among climate scientists. But there is potential for progress by informing people of the true state of both the scientific consensus and public opinion. The scientific consensus has been the subject of deliberate misrepresentation, and correcting this will be far from easy to achieve. But at least research is giving greater clarity on effective messages and how to communicate them. One barrier to creating wider acceptance of policy to mitigate climate change risks is the tendency people have to consider their own opinion to be the most common among the wider population, and to underestimate the number of people that accept the existence of human induced climate change, both among climate scientists and the wider public. This was spectacularly confirmed by a recent survey of public opinion in Australia[i]. 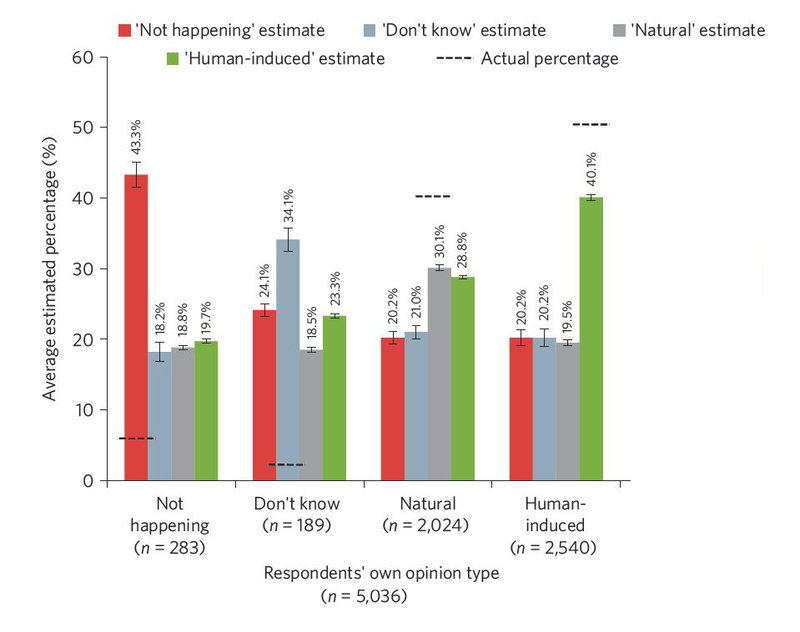 The survey divided opinions on climate change into four groups: “Climate change is not happening”, “Don’t Know”, “It’s happening but natural”, and “It’s happening and human induced”. The researchers asked a sample of over 5000 people to place themselves in the group that most closely matched their view. They then asked each group to estimate how common they thought the four opinions were among the population at large. The results of the survey are shown in the chart below. The labels along the bottom show how many people placed themselves in each group. The columns show the estimates by each group of how many of the wider public they thought held each opinion. The dashed lines show the actual percentage in each group. So for example, the left hand red bar shows on average those whose own view was that “climate change is not happening” thought on average that their view was held by 43% of the public, whereas in fact it was held by only around 6% (283 out of 5036). Those who accepted that climate change is human induced also thought their view was the most prevalent among the four possibilities. However, in contrast to those who did not accept the reality of a changing climate, those who thought climate change was man-made still tended to underestimate prevalence of their own views, with 50% of the total sample (2540 out of 5036) actually holding this view, compared with the 40% estimated by those holding placing themselves in that group. Indeed, the findings, which were reproduced by a second survey a year apart, showed that in every one of the four groups, each representing different views, on average people in that group believed that their own opinion was the most common, rather than any of the other three views, and also thought their own view was more common than any of the other three groups thought it was. This tendency has been found across many different topics, and is referred to as a “false consensus” effect, reflecting for example our tendency to mix with people who tend to hold similar views to own. Furthermore all groups estimated belief in human induced climate change to be less prevalent than it actually is. These effects were particularly strong among those not accepting the occurrence of climate change, but even those who themselves thought that climate change is human induced underestimated how common this view is. This matters particularly because assessing the changes in view over the year (from one survey to the second) showed that those with the greater tendency to overestimate the prevalence of their views were less likely to change them, implying that creating more accurate impressions of general public opinion might help shift opinion. The authors note the specificity of their findings to Australia, and advocate testing in other countries. While this research emphasises the importance of communicating public opinion, other new research[ii], also from Australia, emphasises the importance of communicating the scientific consensus. Researchers looked over a range of topics, including smoking and lung cancer, HIV and Aids and climate change. They found that people underestimate the degree of scientific consensus on each topic. However, they were prepared to change their own views on a topic, increasing their acceptance of man-made climate change, if presented with information quantifying the actual extent of the scientific consensus. Having numbers on the degree of consensus rather than just a general statement about how strong it was appears to have mattered. The researchers used a figure of 97% acceptance of climate science by those in the field[iii]. Previous research carried out in the USA showed that people’s values strongly shape their perceptions of risk (a finding replicated in this survey), and that some personal values can make people resistant to descriptions of the science (see post of 22nd March). However the new research described here indicates that people may be more willing to respond to descriptions of the consensus among scientists than presentations of the science itself. It would be interesting to see this work replicated, especially as the sample of the public was chosen for convenience (they stopped passing pedestrians) and so may not have been representative of the public as a whole in some respects. It would also be interesting to see such work extended to other controversial topics in other cultural contexts. This could include the science of evolution by natural selection, where in the USA lack of acceptance by those with a strong conflict of values appears resilient to overwhelming scientific consensus clearly communicated over decades. However, as the authors note, their finding fits with other work from the USA showing that among Republicans acceptance of the consensus is the strongest explanatory variable for their own acceptance [iv]. Belief in the ability of individuals to do something effective about the problem was also found to contribute to acceptance of the science. The authors of the first study attribute some of their findings to the particular character of the debate in the Australian media. They note the tendency of the media to report the debate in a way that implies that there is more controversy than there actually is as contributing to this. From this perspective, the tactic of questioning the scientific consensus adopted by those opposing action to mitigate climate change – many of whom have repeatedly suggesting that the consensus was actually weaker than it really is[v] – can be understood as highly effective. It targets an area very likely to make a difference to people’s opinions. This appears to have led some to adopt entrenched positions, and some have argued that the focus should be on persuading those who are not already strongly committed on the issue[vi]. But at least there can now, in view of these findings and those reported in my post of 22nd March, be more clarity on the way forward: emphasise the scientific consensus, and the truth about public opinion, use straightforward presentation, including framing the problem sympathetically, use trusted means of communication, targeting especially those who remain undecided on the issue, involve those who have diverse backgrounds and values, and emphasise solutions. No easy task, but at least the basis for a way forward. [iv] Rolfe-Redding et. al. Republicans and Climate Change, Yale Project on Climate Change Communication 2012 http://papers.ssrn.com/sol3/papers.cfm?abstract_id=2026002 The authors note the direction of causality is an issue but argue that their research suggests that knowledge of the scientific consensus causes acceptance, rather than the other way round. [v] See references 20-23 in the Leviston et. al. paper. The approaches used to throw doubt on the scientific consensus on global warming and other issues in the USA has also been well documented in the book Merchants of Doubt, Naomi Oreskes and Erik Conway, 2010. http://www.merchantsofdoubt.org/ .The book contains more detail than many readers will need, but the website contains a link to an hour-long talk by Oreskes, which is a good starting point. [vi] Weber, Psychology: Seeing is believing, Nature Climate Change April 2013. This entry was posted in public opinion and tagged climate change, climate change policy, public opinion on climate change on 24/04/2013 by adamwhitmore. Our values play a large role in shaping our perceptions of the risks of climate change, and this is even more the case for those with higher general numeracy and scientific literacy. Simply providing more information on the risks of climate change is unlikely to be enough to change perceptions of risks. There is a need to communicate with people in ways that speak to their values. There has been much discussion in recent months of renewed impetus towards regulation of greenhouse gas emissions in the USA, in particular following the President’s State of the Union address. But differences in public opinion on this issue continue (along with other factors) to be a major obstacle for the development of stable, long term policy on climate change in the USA. Some decades of effort to communicate the science have not created a shared perception of the risks of climate change among Americans. Recent research, on the American public’s perceptions of climate change and other risks (notably by the Yale Cultural Cognition Project) throws light on why this is so, and suggests some ways of developing more widely shared understanding in this area. The research shows that people’s social and moral values are the strongest predictor of their perception of the risks of climate change – a stronger predictor than political orientation, education, income, gender, racial origin, or any other variable that the researchers looked at[i]. Values are characertised on two dimensions: “hierarchy-egalitarianism” and “individualism-communitarianism”. People with a “hierarchical” worldview tend to believe that rights, duties, goods, and offices should be distributed differentially and on the basis of clearly defined and stable social characteristics, while those of an “egalitarian” worldview tend to believe that these things should be distributed equally. People who subscribe to a “communitarian” worldview tend to believe that societal interests should take precedence over individual ones and that society should bear the responsibility for securing the conditions in which individuals can flourish, while those who subscribe to an “individualistic” worldview tend to believe that individuals should secure the conditions in which they themselves can flourish, without collective interference or assistance. There is a clear correlation between these world views and perceptions of climate risk[i]. Those with egalitarian and communitarian outlooks tend to perceive greater risks from climate change. Those with hierarchical and individualist outlooks assess the risk of climate change as being less. This effect is so strong that general scientific literacy and numeracy does not always tend to increase the acknowledgement of climate change risks. Rather, a recent study by the Yale team[ii] indicates that increased general scientific literacy and numeracy increases the difference in results between those with different values – a polarisation effect[i]. Increases in scientific literacy and numeracy, as measured by answers to a range of questions designed to test general scientific knowledge (rather than specific knowledge of climate science) and numeracy, lead egalitarian communitarians to perceive greater risks of climate change. 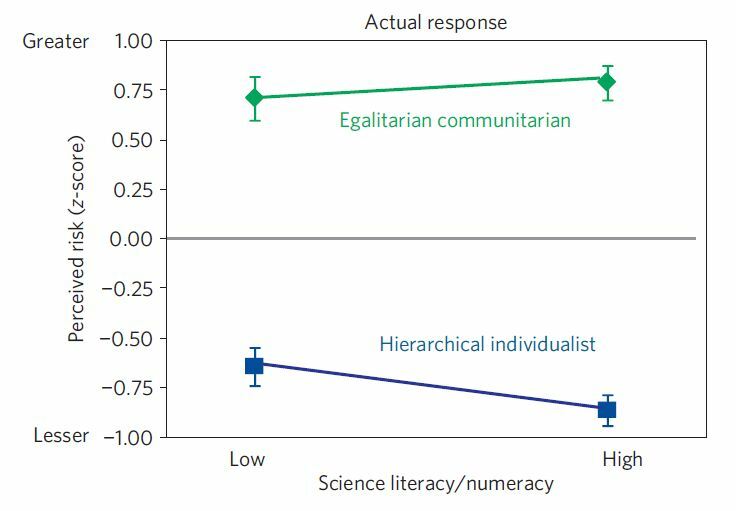 But hierarchical individualists perceive less risk as their scientific literacy increases, although for neither group is the effect very strong compared with the difference between the two groups. The authors of the study speculate that the decrease in risk perception among hierarchical individualists may be because those who are more generally scientifically literate are more successful in fitting evidence to their world view. How much risk do you believe climate change poses to human health, safety or prosperity? The underlying driver for the strong relationship between values and risk perception appears to be the advantages we all find in sharing common outlooks with those around us. Our own views have little influence on the course of climate change, but if our views differ from those to whom we feel close and with whose values we tend to identify we may find it socially costly – whether it is the Boston professor espousing to fellow faculty members the view that mainstream climate change science is a hoax, or the member of a conservative Scottsdale golf club arguing for large-scale concerted action to address the risks highlighted by climate science. But while it may be a costless and socially congenial for any individual to form a perception of climate change risks on this basis, it is harmful for collective welfare for people in aggregate to form beliefs in this way. The authors call this a “tragedy of the risk-perception commons”. The research implies that additional presentations of the scientific evidence on climate change to address a supposed deficit of information or understanding is unlikely to be enough to persuade those who perceive a conflict between the science and their values to acknowledge the risks. However an important caveat here is that as the survey tested general scientific literacy, not specific knowledge of climate change science, it remains possible that greater knowledge of climate science might shift perceptions, as some other work has found[iii]. So, if additional presentation of the science is not enough what can be done? The research is specifically American, and does not deal with the extent to which the conclusions may transfer to other cultures. Nevertheless, it suggests a number of important lessons for communication on climate change which may well prove transferable, and which may help to avoid unnecessarily alienating those with hierarchical and individualist values. First, changing perceptions of solutions to limiting climate change can alter acceptance of the science. Hierarchical individualists are more likely to accept the truth of a description the science of climate change if it is said to imply an increased role for nuclear power than if it is said to imply increased regulation of pollution. This is because nuclear power is more consistent with their value system, for example involving mastery of nature and respect of technical elites, than is the increased control over the activities of firms and individuals implied by pollution control regulation. Also, it matters a great deal who is giving the message. People are more inclined to believe information coming from someone they think shares their values, especially if it is contrary to the views they might expect the person to espouse. This implies, for example, a presentation from the US military about planning for climate related conflict may prove more persuasive to those with hierarchical values than a video by Al Gore. Other researchers have found that framing of the story affects responses[iv]. The more a message speaks to issues that matter to people, like public health, the more effective it is likely to be. And, finally, presentational form can matter, with graphical information[v] more effective than text. Incorporating these finding into discussion of the issues will not make the task of creating a wider understanding of climate change risks easy. But at least the tools of science are being applied to communicating the message, as well as ensuring that it is robust. This entry was posted in public opinion and tagged climate change, climate change policy, public opinion on climate change on 22/03/2013 by adamwhitmore.